Barbara from ReKnitting posted about this, and I decided to join in. 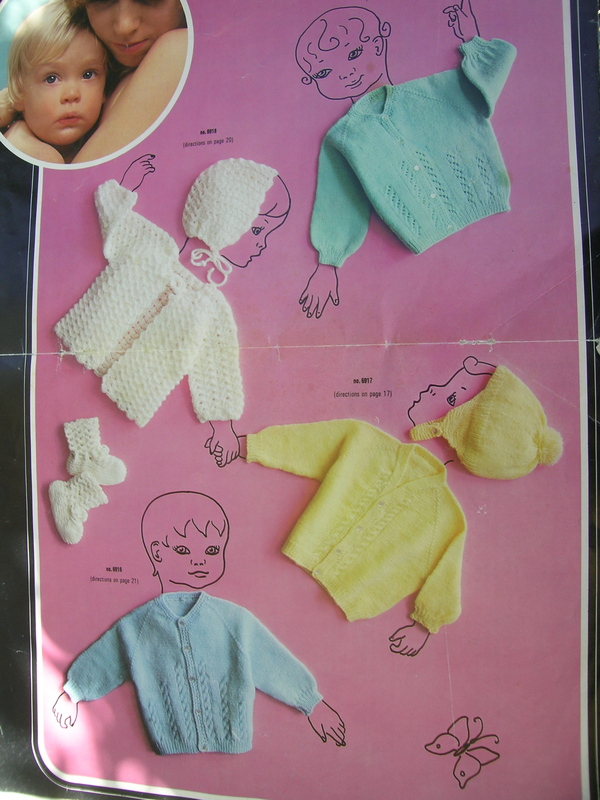 I began knitting and crocheting as a small girl. My memory has always said 7. Not sure if that is exact, but it is close. My mother did some crocheting and knitting, but not much. She had little time with 10 kids utimately in the family, and working full time a lot of those years. I am the only one who took to knitting and crocheting and sewing along with her. She was an excellent seamstress, used to make matching outfits for all 6 of the older girls with elaborate designs embroidered in with her sewing machine. I remember knitting slippers for family members, from 2 books that were a remnant of her one room schoolhouse teaching days (I have those books, but they are packed away with all the kids books in the attic). I would pour through those books, they had stories, craft projects, history, everything one would need, it was my inspiration. My mother was of German heritage, and knit Continental. That is how she taught me, except that she is left-handed and I am right -handed. So, I knit in a very unique way. It is very fast, I purl as fast as I knit, and can do ribbing almost as fast as plain knitting. Unfortunately, I have been unable to teach anyone to knit the way that I do. (She also taught me to tie my shoes, and that was not as successful). 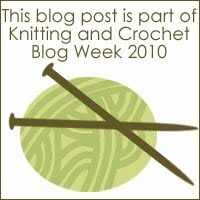 I then started knitting afghans for everyone, crocheting ponchos, and the occasional baby sweater for a neighbor or relative. I have this book that my mother bought. I had to look up the Roman Numeral conversion, which was a publication date of 1973. While my mother has her name at the front, I am sure that she bought this for me to make projects. I have knitted almost everything in this book many times over. 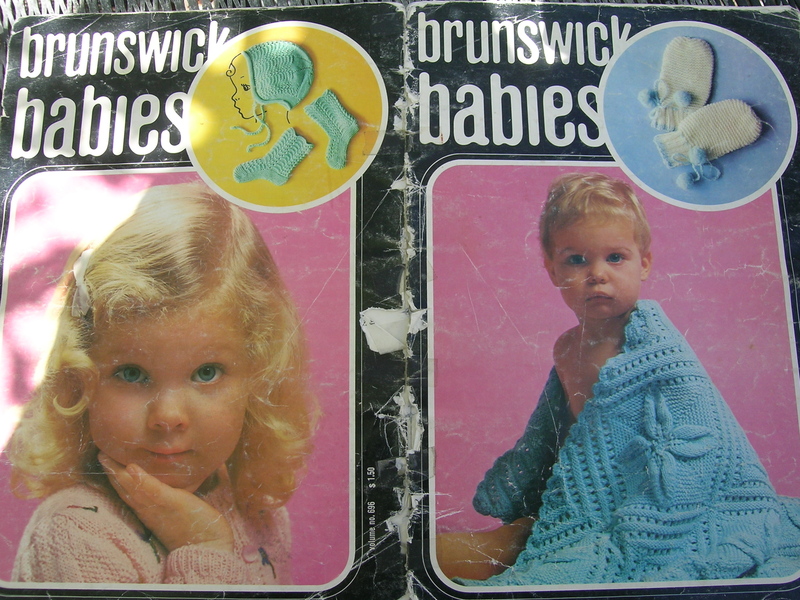 These were, and still are, my favorite baby sweaters, as I love the raglan sleeves. I still knit these for gifts today. 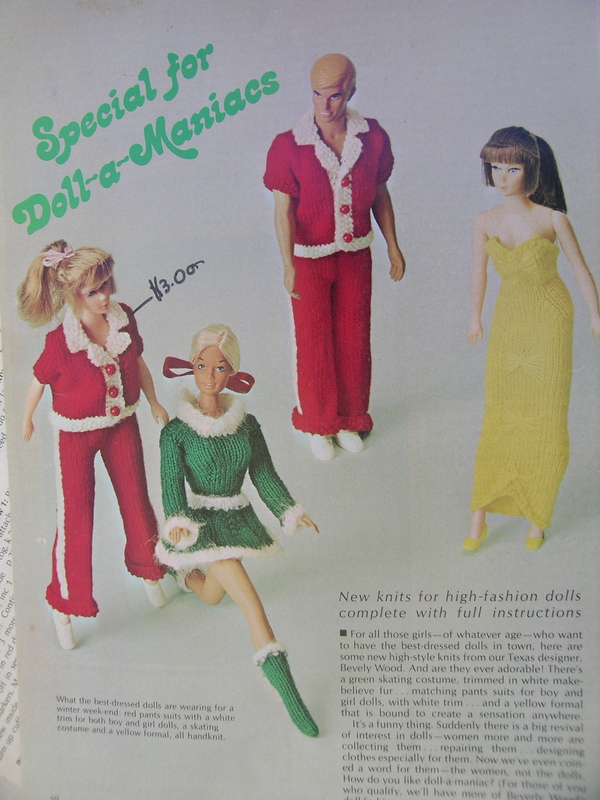 In my pre-teen years, I started making Barbie Doll clothes. This is where I really honed my skills. I was having lots of orthopedic surgery and unable to go to school. The wonderful woman, Joan, who watched the twins, also kept me company. She was an excellent knitter, and I had lots of time to observe her. I would race her (in my head without her knowing), by waiting until she started a new row and trying to finish mine before her–my mother told her this a few years back, and she said that she always wondered why I was staring at her. My school work took all of an hour, so I spent lots of time knitting with Joan while the twins napped in the afternoon. 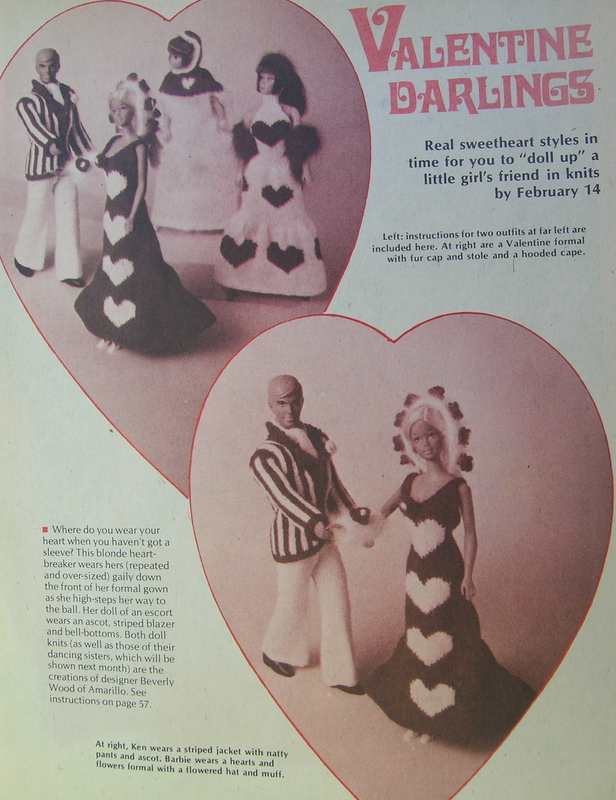 My mother found a Lady’s Circle magazine carrying Barbie patterns, and bought each of the 3 in the series for me, and again when they repeated it later. She then set me up in a craft cooperative, Ledge Craft Lane, of which I am still a part owner, one of the original I think. 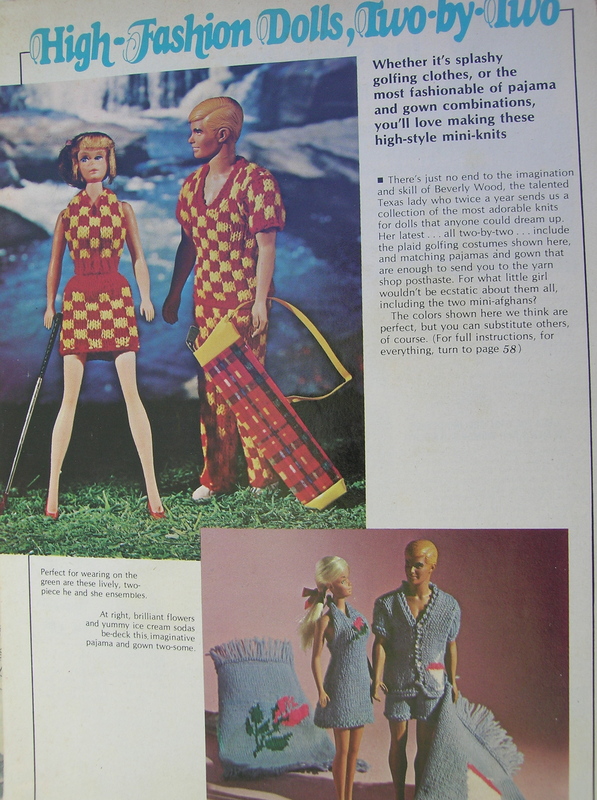 I knitted and sold these patterns, and made money that I then used to purchase a horse in High School, a beautiful 1/2 Arabian, 1/2 Quarter Horse, named Babe’s Rotaz, but called Jimmy. I loved those patterns. 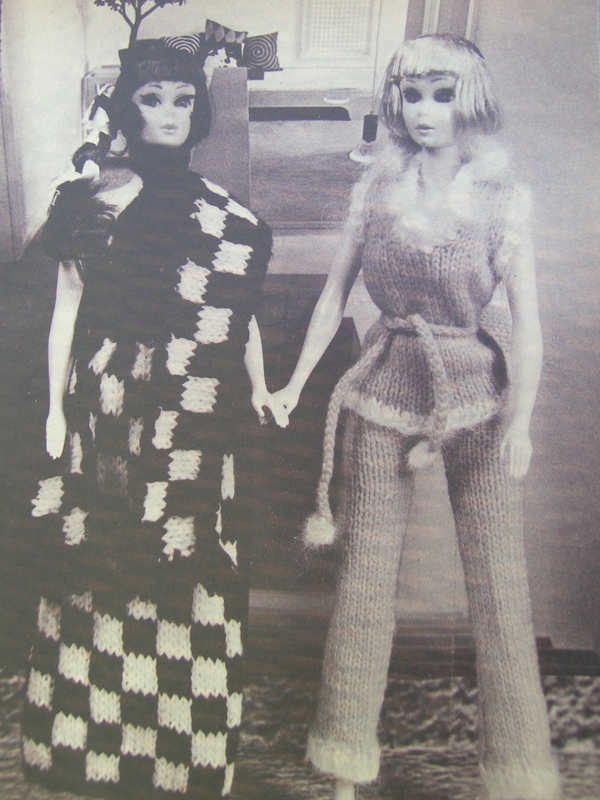 Unlike the ones that are made today, they were fitted for the doll with elaborate decreases and increases to fit her distorted figure and small waist. 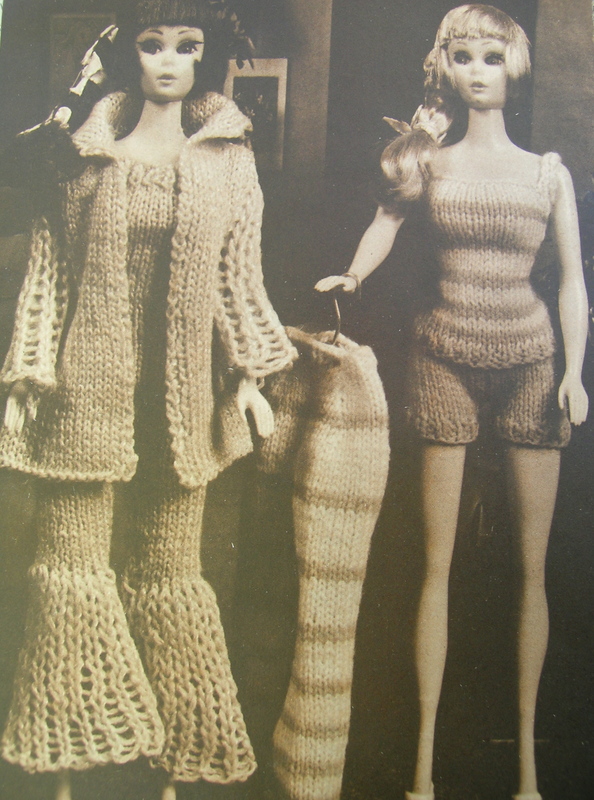 Today, the patterns rely simply on the stretch of the knitted fabric, and are simply a series of tubes. Notice, I marked the price on some of my more popular items. 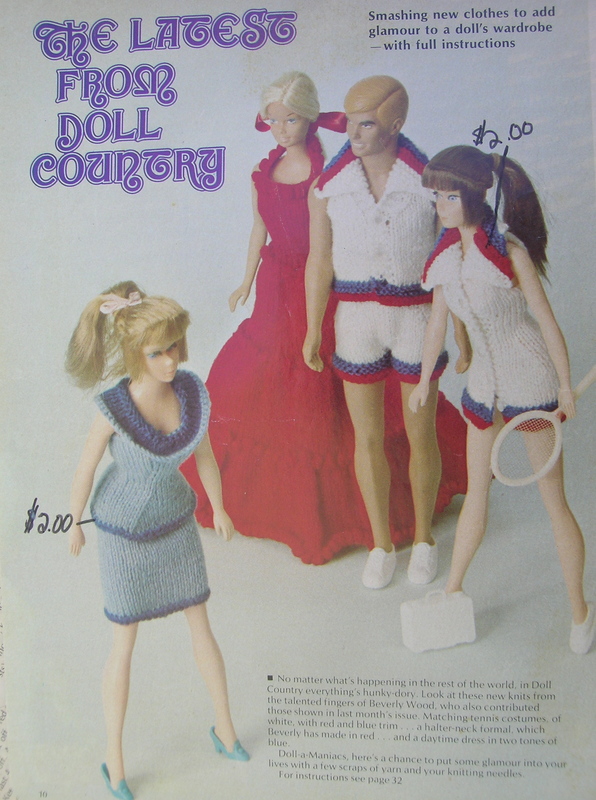 I would go with my mother to Meiers and KMart, and buy the Red Heart baby yarn. Even then, it was always exciting to come home with some new yarn and ideas. I never quit knitting, not even through college. It was my first month at college that I found a wonderful knitting store, and discovered natural fabrics. 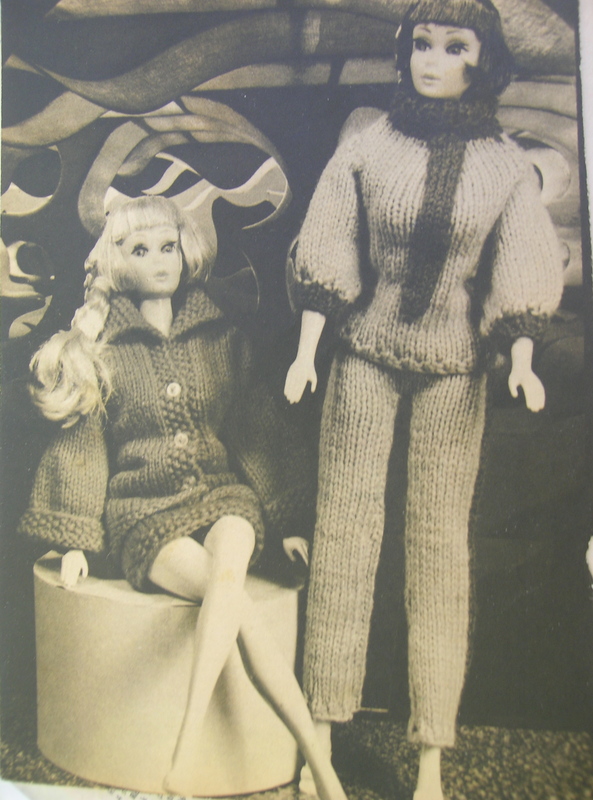 I still remember the trips to that store, and have 2 sweaters that I knit with yarn from there. It was in Ann Arbor, in the wonderful Nickels Arcade. Whaa!!! Your photos are great! The babies things are really nice and still in fashion! 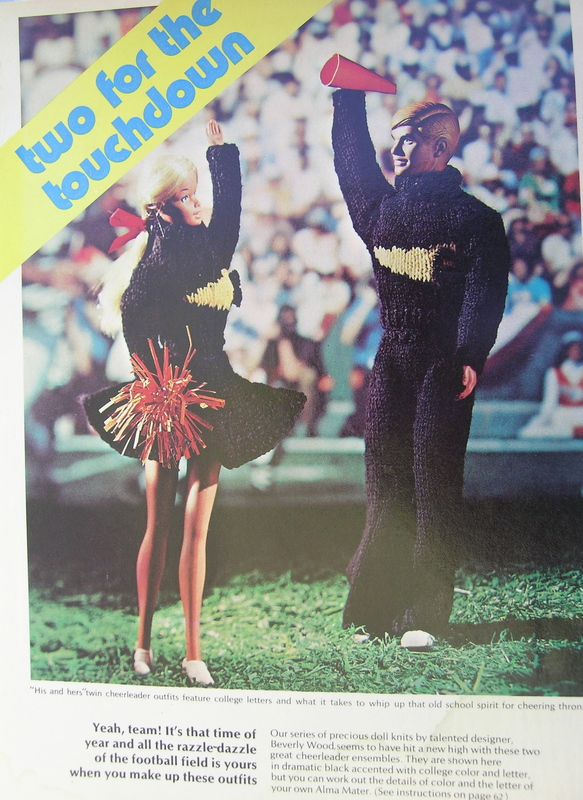 Your post remind me that my mother has some old issues from a french magazine called “Les tricots de Pernelle” .